Fleetwood Town boss John Sheridan was pleased to see Kyle Dempsey use his licence to thrill and open his account for the season. Sheridan has allowed Dempsey to take off the defensive shackles and get forward more. The midfielder, who netted double figures in his breakthrough season for Carlisle United, is finally among the goals after scoring in last Saturday’s 2-0 win against Northampton Town. 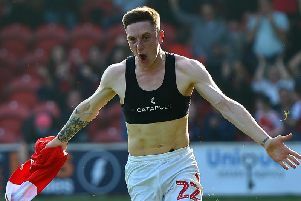 Despite that early haul at Carlisle Dempsey has never really been in the goals at Highbury, netting just twice in last season’s run to the League One play-offs. Sheridan, who scored plenty of goals from midfield during his career, believes a player of Dempsey’s talent should be netting more regularly than he has managed so far. Nevertheless, he praised the 22-year-old for his showing in a game that saw Fleetwood climb five points away from the drop zone. He said: “It is good awareness from Toums (Toumani Diagouraga) who squares the ball to Kyle. “Kyle should be scoring seven, eight goals a season with what he has got in his game. “I thought he was excellent; it is a good finish and it just gives you that breathing space. Sheridan named an unchanged team last weekend for the first time in his five-game unbeaten run as Town manager. He also stuck with the 3-5-2 formation that saw him pick up his first win as boss in the 2-0 win at Rochdale last week. He explained the reasoning behind that decision as well as reserving praise for his wing-backs, Lewie Coyle and Ash Hunter, who was once again deployed out of position at left wing-back rather than in his usual role up front. Sheridan said: “Northampton hadn’t been playing 3-5-2 usually but they played really well against Shrewsbury kept the same formation, which made my mind up in us keeping the same formation. “If they would have played a different formation I probably would have changed my team but I think we look quite solid. “I look at both Coyley and Hunter working their socks off defensively and attacking.